In only one month I will officially be teaching kindergarten for the first time. I was so worried about reading and writing for the longest time. Well we actually started our kindergarten curriculum this past winter and have been working through at a snails pace keeping it fun and light. One of the biggest things I noticed is that I need a variety of tools on hand to keep the interest. Yes, our book work is thorough but some days are lighter than others. Some days we need a little break from workbooks as well. Talking Fingers Inc. has created an online program great for supplementing our reading curriculum. 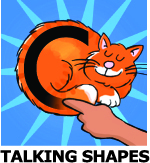 Talking Shapes: A Supplemental Curriculum for Early Literacy - this is an online program that is designed for beginning readers to have additional practice with reading and writing. The version I received is done on the computer but they also have an app version as well. This program has a story kids are encouraged to listen too. Then they learn letters. The letters are featured in an interesting way. For example a picture of a curled up cat will be for the letter "C" and the program will teach you to create the letter with the picture. (This is an unique way of learning by associating letters with pictures.) They learn to use the computer mouse to draw the letters. Next they play games using those creative letters to make words. Lastly they practice reading by also playing a game with the words they learned. There are seven levels to this program - as you can see in the graphic above. Each ''story" is the work for the level and you work on completing them in order. My five year old has been slowly beginning reading. He was at the perfect level for the first story in this program. He was able to complete most of the work almost all on his own. It wasn't too easy but rather it was at the perfect level because he already understood those sounds featured. This was an interesting program. We had previously used Talking Fingers from this company and Jace still begs to do that weekly. This one was a bit more work for him so he progressed a little slowly. He is lately not a fan of reading books or having them read to him (a stage I'm sure!) so that part was difficult for him to sit for but once he got into the game part he really enjoyed himself. I thought that writing letters with a mouse was a bit difficult and I'm not sure that part worked for us. I liked the practice of putting words together and I think that was very beneficial. I can see this working well as a supplement for reading (that's how we will continue to use it.) I also see this working well for kids who love to learn on the computer. The stories and graphics were cute and engaging. Click on the banner below to see what the rest of the Crew thought of this program!